The Ford Mustang Exhaust Kit with Dual Chambered Tips is designed for 2013-2014 V8 engine including 5.0L and 5.8L as found in the GT, GT500, Boss 302 or California Special editions. The dual chamber tips on the exhaust require the ROUSH 2013-2014 Mustang rear valance part# 421406 for proper fitment. The Ford Mustang rear valance and exhaust kit with dual chamber tips is the same as used in the ROUSH R6 aerobody kit found on our production Mustangs. The ROUSH Mustang exhaust kit mufflers differ substantially from the conventional fiberglass-packing found in other manufactures mufflers. The ROUSH muffler produces a less inhibited sound, increased air flow (maximizing power), and increased longevity (there is no fiberglass that would break-down over time). Another great feature of our Mustang exhaust kit is the lack of the typical in-cockpit boom at cruising speeds found with most performance exhaust systems. The chrome flashing used in our Ford Mustang exhaust with dual chambered tip is bonded micro-porously to the metal surface. The result is a finish that is highly resistant to cracking from localized damage and heat color change for a better look on your Mustang. Conventional chrome plating is susceptible to cracking and flaking, especially when subjected to heat (as is found with an exhaust). The inlet pipe and mufflers are made from a 409 stainless steel for enhanced durability. The exhaust system is designed with OEM CAD data to ensure precise fitment on the 2013-2014 Ford Mustang. 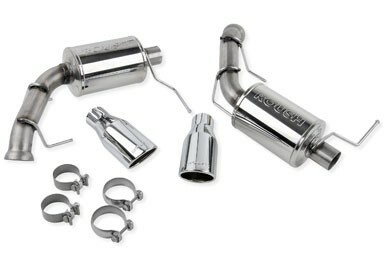 A key component of this Mustang exhaust kit is the unique ROUSH open-chambered muffler design. The exhaust system muffler is manufactured to have no in cabin drone or boom and does not negatively affect emissions. Our 2013-2014 V6 Ford Mustang exhaust kit with dual chambered tips carries ROUSH’s 3 year / 36,000 mile limited parts warranty. 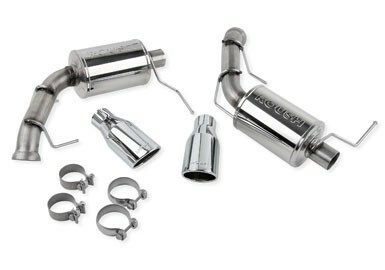 The Mustang exhaust is easy to install in about an hour (estimated on skill and tools available) and each kit includes all required hardware and instructions.